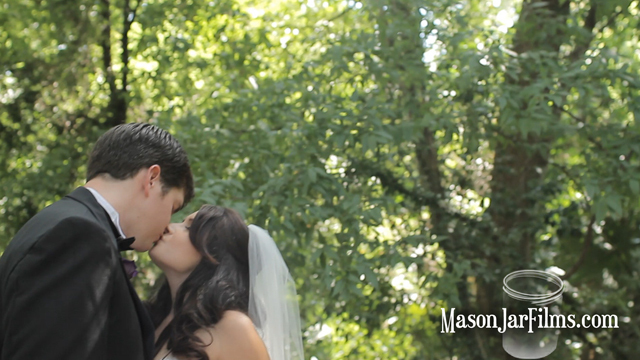 You've just watched a preview to the wedding film of Jennifer and Matt. Matt proposed to Jennifer on a mini-vacation to South Padre--Jennifer told us she had been so busy with school that she was "oblivious" to the proposal even as it was happening, and when Matt was down on one knee on the beach pouring his heart out. In her words she told us, "So I am thinking he is joking :) I tell him that this is not funny and is he serious. He then says, 'Jennifer will you Marry Me?' and with that question he reaches into his pocket and pulls out a box with the most beautiful ring. It was exactly what I always dreamed about :) Of course I said yes!" On the wedding day, we arrived to the Austin Museum of Art ready to go--it is a gorgeous place, and practically in our backyards in Austin, TX. It has this timeless hollywood glamour that wraps around your party til the only thing you'll remember is twinkling stars, grecian statues, and the sound of your dearest ones laughing around the dance floor. The building itself is a stucco building with Spanish Tiles, hardwood floors, and latticed windows. As you drive through the gates, a circle drive leads around the grassy lawn, lined majestically with palm trees (often a ceremony site). The museum sits on a small rise next to the lake, and there's also a deeply shaded space for ceremonies on the sharply tier-cut hillside. Walking paths wind through the wooded areas. Gardens with sculptures, fountains, and columns scatter across the grounds, and giant oak trees swoop gracefully overhead, swaying in the summer heat. Evergreens, tall and slim, spiral into the sky like guardians around the musuem. The bridal prep room has black and white checkered tile flooring, with sunlit windows on all sides peering down at the grounds. Jennifer chose an array of purples, pinks, and fuscia for her bridesmaids to carry, as seen here next to her bridal Jimmy Choo heels. Jennifer and Matt chose to have a first look, which is a tradition where the bride and groom see each other privately before the ceremony. This allows them to let go of a few of those pre-wedding jitters, have a private conversation before the big day really kicks off, and (BONUS) get most of the formal photography out of the way before the ceremony. This ensures that the cocktail hour will be filled with more visiting with friends and less posing for portraits.